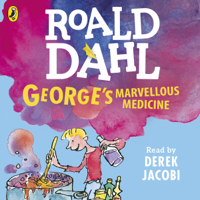 Penguin presents the audiobook edition of George's Marvellous Medicine by Roald Dahl, read by Derek Jacobi. George Kranky is eight-years-old and wondering what sort of mischief he might get into. George's Grandma is a grizzly old grouch and George wants to teach her a lesson . . . And when Grandma's finished drinking George's marvellous medicine, she'll really have something to grumble about.